TRUE STORY. MY WIFE teaches grade school. In addition to the stories I can tell, and the ones my many friends who teach or are married to teachers can tell, during the school year, I hear a new one practically every day. Here’s one: several teachers noticed that three siblings (third grade and younger) were digging through the garbage at school. Turns out they were looking for food to take home for the weekend since there would not otherwise be enough. Here’s another: one of my wife’s fifth grade students broke down in class one day, and explained she was having trouble studying for the standardized test—a whole other topic—because she hadn’t eaten and was hungry. A few teachers pitched in to get her fed, and take some snacks home. Turns out her family was homeless and living in a motel. My wife, a veteran with more than a decade’s experience in public schools, is not easily upset: it’s been her practice for years to keep extra non-perishables in her desk for the kids who can’t concentrate on empty stomachs. This is not Appalachia, or even the most desperate inner city; it’s a county less than thirty minutes from the nation’s capital (the state of which is itself a never-ending metaphor for all we need know when it comes to equality, opportunity and our collective genius at hurting the most innocent and vulnerable amongst us). Another story. Several years ago, she noticed one her students hoarding ketchup packets from the cafeteria. He was bringing them home in case there was nothing to eat. The worst one? For me, it’s the story of the student who claimed he wasn’t hungry at lunch time. Because he was embarrassed. He didn’t want to admit he had no money. My wife could literally hear his stomach rumbling as he pretended he wasn’t famished the same way Republicans pretend they care about people. Never mind Trump. One need look no further than Betsy DeVos to understand the true depravity of the contemporary state of all-things GOP. 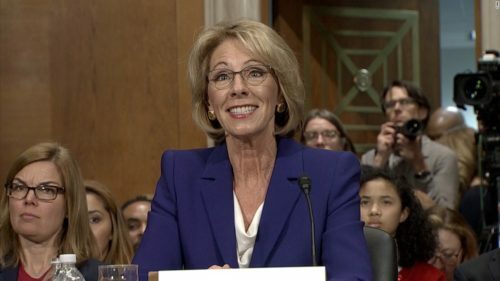 Did you catch any footage of DeVos’s hearing? If you have a strong stomach, you should, especially if you think the criticism of her has been over the top. How about the footage of her speed-walking away from a group of protestors? These fanatics have been insulated by their money and blissful ignorance so long they’re flummoxed (and genuinely frightened) by the slightest resistance. And all of them (look at ongoing embarrassment of Republicans scurrying away from their own town halls, or The King of the Cowardly Cretins, Mitch McConnell, doing everything possible to avoid any public scrutiny of his healthcare bill) have no means to debate or defend themselves when challenged. Classic bullies. Extolling the alleged virtues of the free market, no matter what contrary evidence accrued, mostly worked wonders for the Republican party these last few decades. We now are at a point where they’re acting, in concert, to raid the already paltry provisions of the disenfranchised. And to what end? Funding infrastructure or some national emergency? Of course not. Exactly what they’re after is simple, and truly staggering: to ensure that those born with every advantage will have still more opportunity and money. Revolting in the extreme. But therein lies an opportunity. Audacity of this level is so breathtaking it’s negligent to become cynical; unacceptable to be indifferent. We’re at a threshold moment, where otherwise apathetic spectators must determine if they are, at long last, disgusted with the direction we’re headed. Doing nothing, at this point, is abetting evil. (And this includes not just going toe-to-toe with the True Believers across the aisle—many of whom, of course, stand to be most drastically impacted by all these reverse Robin Hood policies—but the pampered and recalcitrant nitwits who still insist Hillary Clinton was, at best, the lesser of two evils, or remain third party or bust when we see, daily, the disparity between what Democrats and Republicans do, when in power.) Advice: frame an argument, for once, that puts liberals on the right side of Scripture (what a concept!) and put the stakes in stark relief: it’s no longer a shell game, no more talk of trickle down; this is straight-up thievery, taking from those with the least. I think Jesus said a thing or two about this. 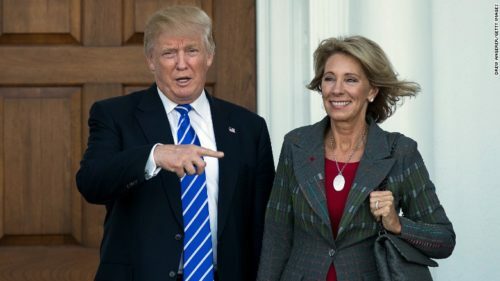 Finally, it’s tempting, even irresistible, to catalog the myriad flaws, hypocrisies, moral failures and rank opportunism that has virtually defined DeVos’s existence. But it’s more effective to look at her as the caricature she is. She represents the faceless figure epitomizing the worst Republican impulses, all untethered by our incurious, incompetent Tweeter-in-Chief. Never mind him, or her, and remember it’s not who she is, but what she represents. DeVos, and her merry band of nihilists, are the boot in the face Orwell warned us about. That is what must be resisted, mocked, defeated. A final story. One of my wife’s friends, who teaches high school, had a student who was arrested for shoplifting. It turns out he had been doing this from a young age. He was stealing food. To eat. Think of this kid, and all the other ones, especially the ones with increasingly fewer advocates who can defend or assist them. This entry was posted in Worst People in America and tagged 1984, Betsy DeVos, democrats, Dickens, Donald Trump, George Orwell, GOP, health care, Jesus, Obama, progressives, Public Education, Republicans, Ronald Reagan, Tea Party. Bookmark the permalink.